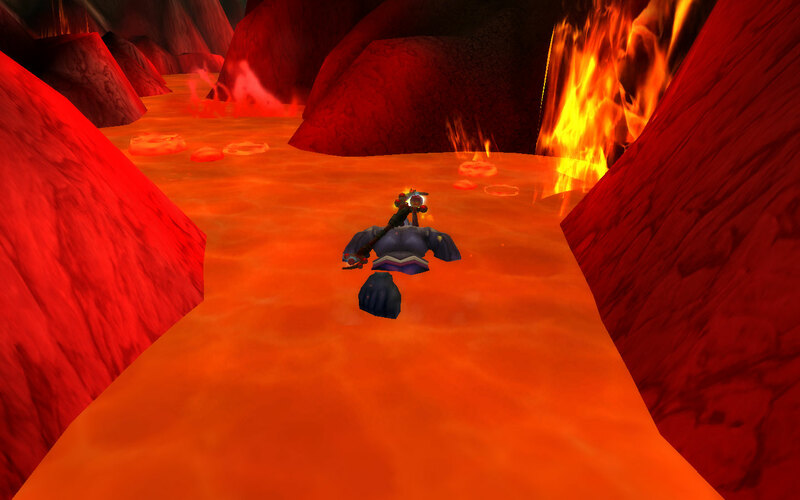 Turn into an ogre and swim in lava? Done it. Bravetank posted a writeup of 10 things they've never done in WoW, and it has similarly inspired me to do the same. This may or may not have to do with me not writing about WoW in a long time. ...cleared any Cataclysm raids. The guild I started the expansion with wasn't capable, and I just haven't made an effort to get that done. This is all despite the fact that my current guild does raid every week. I just have trouble getting inspired to pull the time together to do so. No LFR. I only completed Baradin Hold when it had one boss in it. ...leveled a Horde character past the low 60s. My highest level horde character is a Forsaken warrior who's still in Hellfire Peninsula. I started playing as Horde, but fell out of playing Horde because Sarah and I wanted to level a paladin and a shaman together, and thus we rolled Draenei (since this was before Cataclysm when Tauren gained paladins). ...leveled through the 1-60 content after Cataclysm. I think this is mainly because I took a break during the middle of Cataclysm. I know that there is a ton of really great stuff out there and I really want to see it. ...leveled a plate wearer to 85. I have a level 80 Death Knight from Wrath that just kinda happened? I started it out of curiosity and that curiosity carried me to 80 where he stagnated. I'm currently leveling a Blood Elf warrior who is in his 20s. ...done the Molten Front. I'm working on it right now and I HAVE to do it. I have a thing about hippogryphs and bear pets. I got both of the hippogryphs from the Argent Tournament as well as the bear, squire, and the squire's horse. The Argent Tournament had a TON of great stuff. ...gotten a Amani Bear. I was upset that they removed the bear from Zul'Aman back in patch 3.0 and was so happy that they added the bear back into the revamped Zul'Aman. This is another thing that my guild is doing that I for some reason haven't gotten involved in. ...used a highly customized user interface. I use the base interface (I don't even have a boss mod or recount right now). I don't think I actually have any addons at the moment. ...been an auction house aficionado. I just post my stuff just below where other people have it posted. I've very rarely bought an item and flipped it for a higher price or bought something to make it into something else to sell at a higher price. An AH Baron, I am not. ...read a Warcraft novel. The only WoW fiction that I've read was some of the comics. The Ashbringer series of comics was quite excellent and I highly recommend reading it. But there is no way that you could get me to read a novel. ...gotten any of the Cataclysm drakes. I just realized that while writing this. It seems like it'd be prudent to do so. I think I'd like to do this through the Glory of the Cataclysm Hero achievement. So what have you never done? My list is pretty decent and I really hope to accomplish some of these some day.